CIUDAD JUAREZ, Mexico (CNS) — As soon as Rosa and Sergio Siller heard Pope Francis was visiting Ciudad Juarez, they knew they had to visit. 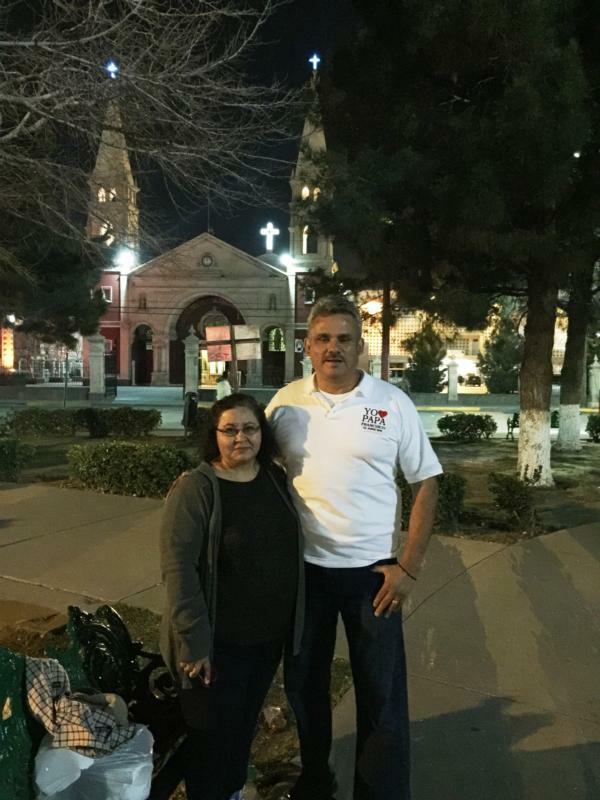 The couple led a group of pilgrims from Sacred Heart Parish in Phoenix to Sergio Siller’s hometown, the last stop on Pope Francis’ Feb. 12-17 visit to Mexico. “Being from Juarez, and after all this turmoil that happened, we’re so blessed the pope (will) come to Juarez to bring a message of mercy, forgiveness and hope,” said Sergio Siller. The Sillers typically visit Juarez three or four times a year, but when they learned of Pope Francis’ visit, they made arrangements right away. “As soon as we learned, it was like, ‘Oh my goodness, we have to be there,'” said Rosa Siller. They are meeting with four other pilgrims from Phoenix while they’re in Juarez, she said, adding that relatives from as far north as Indiana also were coming. While they are in Juarez, the pilgrims hoped to visit several pilgrimage sites within the city. While visiting San Lorenzo parish, one of the parishes with a designated Door of Mercy, the Sillers also shopped at the gift shop to buy gifts for friends and family to be blessed by the pope. In the San Lorenzo parking lot, Juarez locals Carlos Torres and Lourdes Gutierrez took the pope’s challenge to be “missionaries of mercy” to heart, passing out commemorative posters of Pope Francis’ visit. When asked how much the posters were, they said they were free. Torres and Gutierrez are parishioners at nearby San Judas parish and are part of an unnamed group of Catholics from various local parishes wanting to show hospitality and mercy to all of the pilgrims. “We’ll be meeting with some families to buy drinks, water, sandwiches, etc., for the people who will be waiting for the pope to pass,” Torres said. San Lorenzo was the pair’s third stop late Feb. 15. Gutierrez said she was filled with “excitement, joy, peace and much more joy,” at the pope’s coming visit to her city. “We want the pilgrims to leave with a beautiful image of the people of Juarez,” she said. Juarez has been plagued by violence over the past decade, with the homicide rate peaking above 3,100 in 2010; 300 murders in 2015 was the lowest reported since 2006. “There’s hope. God knows we’re in need here,” said Rosa Siller. “They need to feel like (Pope Francis) is bringing a message the Lord loves his people. Gutierrez is editor of The Catholic Sun in Phoenix.